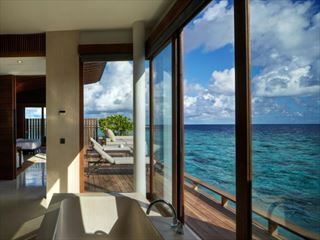 A luxurious all-villa resort, Shangri-La’s Villingili Resort & Spa offers an indulgent experience with breath-taking tropical surroundings. Immersed in stunning scenery of over 17,000 coconut palms, vast stretches of picture-perfect coastline and azure lagoons, the backdrop to this resort is truly inspiring. There are various villa types to choose from, each with elegant décor, beautiful vistas and contemporary furnishings. This peaceful retreat caters to adults and kids in equal measure, so it’s a great choice for family getaways in the Maldivian sunshine. The Cool Zone ensures children have plenty to keep them entertained, from jungle trails and yoga to nature arts and crafts. For the adults, there’s the pampering spa where you can treat yourself to a traditional massage or an Ayurvedic treatment, or take a boat trip out in search of dolphins. There are six restaurants and bars to choose from, with a great selection of culinary offerings, cocktails and entertainment to enjoy. If you’re a golf enthusiast, the nine-hole golf course offers panoramic ocean views for you to enjoy in between practicing your swing. And the crystal clear waters lend themselves perfectly to water-based activities – the resort offers snorkelling and scuba diving options, in addition to scenic boat trips. 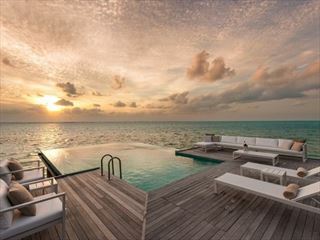 Set in the southernmost portion of the Maldives, Shangri-La’s Villingili Resort & Spa is encircled by coral reefs, nature trails, endemic flora and vast swathes of coconut palms. This area is remote and uninterrupted, offering a true taste of tropical paradise. The resort is situated a 70-minute flight from Male International Airport, followed by a five minute boat ride from Gan International Airport on Addu Atoll. Shangri-La’s Villingili Resort & Spa operates +1 hour ahead of Male for daylight saving time, your onwards seaplane to Male Airport will reflect Male & Gan time. The resort offers 132 villas in total. *Please note that we do not recommend this villa to families with children under 12yrs due to the open nature of the design. computer gaming stations. There is a bar serving beverages and snacks. beauty, as well as the best dive sites nearby. You are required to provide a valid Marriage Certificate at time of check-in. Endheri Pool facilities including: Complimentary cold towels, chilled water and cooling spray, chilled fruit around the pool, Sun lounges and towels. 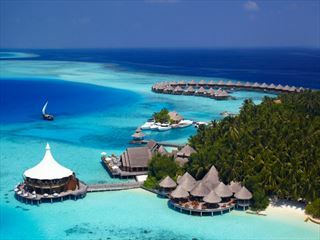 Complimentary Villingili Eco Tour with guide. Nespresso machine in room, 40' LCD TV in all rooms and Bose DVD player. Unlimited Selection of white wine, red wine, beer, spirits and selected cocktails in restaurants and bars only.